Do you pride yourself on being that sort of person who knows exactly what he or she wants? You know your own likes and dislikes well so you never trouble yourself with venturing into the unknown. If you are the sort of person who lives your life in this way then you should be told that you are missing out on so much in your life. No matter what your age is you should never shy away from trying new things or accepting change with open arms. There is some truth in the common saying that the only thing certain in life is change and death. So before its too late, live your life to the fullest and make as many memories as you can. Getting out of your comfort zone could indeed be a tough task for some, yet it is worth the risk. Given these are the things to do to get out of comfort zone or some ways of how you could get out of comfort zone and stop holding yourself back. 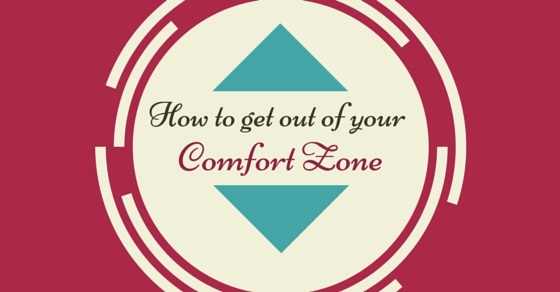 The following mentioned are few tips on how to get out of comfort zone and ways to step outside your comfort zone and live comfortably. Everybody loves open minded people who are approachable and broad minded. It is only when you have an open mind that people feel and be comfortable to talk to you and they begin to share their inner thoughts and secrets with you. When you sit in a narrow chair and are unwilling to broaden your horizons then you often come across to people as a bore. You should always remember that age is just a number and that you decide how you want to live your own life. Not being judgmental or not sticking to conventional ways of thinking could help you open up and appreciate the things which are really important in life rather than focusing on those things which really do not matter at all. One of the best ways to get out of comfort zone is making new friends even if it is with those people who you have little or nothing in common with. It’s good to have a steady circle of friends but you should not feel uncomfortable with meeting new people. Befriending a spontaneous and fun loving person could really help you step out of comfort zone. Breaking out of your comfort zone helps one gain a new insight or perspective into life. A quirky friend will teach you how to treasure each moment and have a little fun even if it means getting into a little trouble. All these wild times will go on to become beautiful memories which you can look back on and remember fondly. Having a little fun is alright but at the same time you should make sure that you do not let things go out of hand. Getting out of your comfort zone does not imply being influenced by negative things nor does it imply turning into a new person altogether. When trying your hand at something new you should never be too afraid or timid as the worst thing that could happen is a failure. Failure is a stepping stone to success and even if you do not achieve success the first time you should continue trying. If after failing the first time you realize that maybe this task is not your cup of tea then you can give up. Achieving success in everything is not the be all and end all of life. Keep in mind that “You should never let the fear of striking out keep you from playing the game”. Even what might seem to be a dismal, embarrassing failure right now might become a funny memory for you later on. A good way of getting out of the comfort zone is by simply accepting yourself as you are and learning to laugh at yourself. It is only when you are comfortable in your own shoes that you do feel insecure about yourself. When you start doubting or second guessing yourself you are doing nothing but feeding your insecurities and making yourself weak. No one is good at everything so you should not feel bad when you try something new like riding a unicycle and you keep falling down. When in a situation like this the best thing you can do is laugh it off. The biggest sign to know if a person is mature and comfortable in their skin is by their ability to laugh at themselves. If you take everything too seriously then you are making yourself weak by letting other people get to you. One of the best ways to get out of your comfort zone is by being open to change. You can get out of the comfort zone simply by getting a new haircut or buying a new crop top! In the course of your life many people are going to try and make you fit into a mould or tell you to stick to the status-quo but you should never be weighed down or believe in such negativity. The chief driving force in your life should always be your own inner voice. You should never try so hard to fit in that eventually you lose sight of who you are. Very often even small changes make people uncomfortable as they believe change is a negative thing but every once in a while change is necessary. Even if the change is something as small as taking a new route to work every morning, something good might come of it as you might make a new friend or discover a lovely little eating joint in the bargain. Once you have started opening yourself to new experiences no matter how small they might be, you could go on and explore greater things like travelling to a new place, going trekking or even going on a road trip by yourself. Such experiences are truly enriching and you will realize that you have learnt plenty of new things, not only about the world around you but also about yourself! In addition to being open to new experiences you could most easily get out of your comfort zone by facing your fears. Everyone has different fears and things which they are afraid of doing but you should never be afraid of facing your fear. If you have a fear of heights then you should make it a point to go trekking or rock climbing, if you have a fear of fire then you should learn how to cook or if you have a fear of water you should learn to swim even if it is in the shallow end of the pool. Facing your fear of failure is a tough task ,yet overcoming your fear of failure is indeed both liberating and exhilarating. In life, people respond to the unknown in various ways, some people enjoy plunging in head first into the unknown while some people have an acute fear of it. No matter what your approach to the unknown is, you should try your best to accustom yourself to enjoy the unknown. In life you will face many situations where you will be uncertain about the outcome. At times like that you should remember that there are only two possible outcomes, either success or failure. Your fear of the unknown, should not be so intense that it prevents you from ever taking risks or accepting opposition and comfort zone challenges. When you go ahead and explore the unknown you will be filled with both sense of anticipation and excitement and feelings like this are just one of a kind. It is perfectly alright to listen to the advice that other people are willing to give you, yet you should make sure that at all times you follow the dictates of your own heart and never blindly follow the rest. Do not think that just because you are living your life on your own terms, other people are going to scorn or look down on you. In life no matter what you do, people are always going to pass their own judgments. As long as you are true to yourself and feel content with what you are doing, you need not worry. If friends, society or sometimes even family cannot accept you for who you are then it’s not fault, it’s theirs. These are some of the best ways to get you to come out of your comfort zone. You can never tell which day on earth is going to be your last one so you should count each day and tread on unknown paths fearlessly, as you never known where these paths might take you.